Do you remember that silly little childhood rhyme? I remember hearing it when I was young…and I remember repeating the chant along with the other little kids in the school yard…. 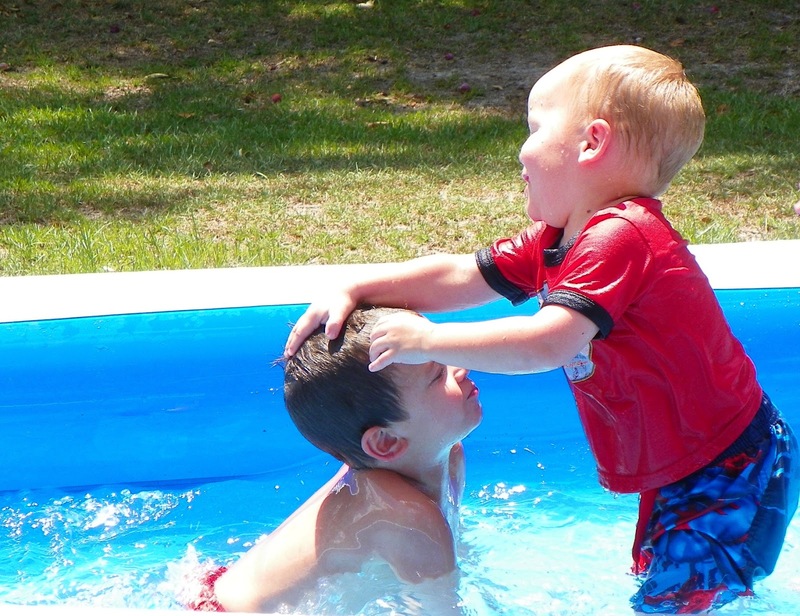 I can hear the “tattling” report from this one pictured now… “Nana, Jake pushed me down in the water”...whiny voice. Did you catch that? We have a non-stop tattle-tale in our midst. Did you have a sibling who constantly was a tattler? I have heard my grand-kids do the tattle-tale bit. It is aggravating…because they are quick to point a finger at someone else, but –don’t go looking at them. Then the whining starts. Ugh. That is as bad as tattling. Keep in mind…his day is coming. And while “he” knows this very fact, he wants to see just how many of us he can disarm, dissuade, and cast into a pit of total despair with his constant barrage of tale bearing. Something else we need to look at– “and his charges, which are not unfounded, are directed at our conscience”... Hmmm. This is definitely a cause to pause. “Not unfounded”….you mean he is telling the “truth” on us? The enemy has a way of twisting things in such a way we soon don’t know which end is up. He convinces us that we have reason to believe we’re a hopeless failure…he brings up our past…slams it down in front of us like yesterday’s headlines. We begin to wallow in that–we begin to concentrate on what “he” has just “reminded” us of…not what the “Truth” reveals. But every time you listen to the enemy?….You are being fed a bunch of tattlin’ tales. And you are feeling more defeated with every syllable he utters….STOP. I’ve seen some kneel at the altar–give it all up to Christ–feel totally NEW and whole–and then in just a few weeks…they are right back–almost where they started! Why? Because they didn’t get rooted and grounded in the Word…instead–they thought they could just “avoid” a few things and carry on life as usual…without the Word. So! What are we going to do?…. Stop your ears to the enemy by taking in the WORD…fill your mouth with PRAISE to the Father—be the “OVER COMER” that the Word of God already says you ARE! By the way…speak the Word “out loud”…and do the PRAISING…OUT LOUD. That will shut the enemy up. He can’t stand either one of those! This entry was posted on Tuesday, July 10th, 2012 at 10:00 am	and posted in Missions. You can follow any responses to this entry through the RSS 2.0 feed. Amen! Love this reminder of always grasping the Sword and never laying it down…I have a loved one that would be blessed by these words!